24a. [Up in the air], UNDETERMINED. 39a. [Ingredient in some pancake batter], BUTTERMILK. 44a. [“Mothra vs. Godzilla,” e.g. ], MONSTER MOVIE. MASTERMIND and the singular form of the revealer both appeared in the 2008 version of this theme by another constructor. The grid’s got rather wide-open corners for a Tuesday puzzle, with the 9/10 stacks each crossing two themers. The trade-off is that we also get an awful lot of abbreviations and names. BATGIRL, BAILING OUT, and Bernard MALAMUD are my favorite entries here. 36a. [Scottish landowner], LAIRD. I’ve always remembered this word from crosswords of yore because one of the guidance counselors at my high school had that first name. 6d. [Stoudemire of the N.B.A. ], A’MARE. Better know a TAM is a Scottish cap if you don’t know your NBA players. 23a. [Spanish liqueur], ANIS. I hate anise, but I hate ANIS even more. Back in the day, this was always clued as the plural of a particular black cuckoo, but in recent years it’s this damned Spanish liqueur that I don’t think your typical bar is necessarily stocking. 11d. [Start of an alphabet book], A AS IN APPLE. I dispute the clue. “A as in apple” is what you say to clarify which letter you said. Alphabet books use “A is for apple.” I did a Google book search for those phrases in quotes plus alphabet book. 6500 hits for my phrase, 158 for the clue’s. 40d. [Dewy, e.g. ], MOIST. If you’re one of those people who loathes this word in a visceral way, may I remind you of brownies and cake? Embrace the moist! 17a. [Physically fit Turkish leader? ], RUNNING AGA. Running gag is our familiar phrase, and AGA is our familiar crosswordese. 61a. [“That Amin guy who thought he was King of Scotland, right?”], “IDI, YOU KNOW?” “Did you know?” meets brutal dictator. 11d. [Nostalgic song about an Oklahoma city? ], DEAR OLD ADA. Is “Dear Old Dad” a song, or just a phrase and Matt is making up this thing about a song?I would rather have given a shout-out to computing pioneer Ada Lovelace rather than Ada, Oklahoma, population 16,800. No reason you should know it if you don’t live around there, other than that crosswords have been foisting it on us for years. 28d. [Yoko ablaze? ], ONO SMOKING. Fun play on “nonsmoking” … provided you find human immolation fun. Or is “ablaze” slang for smoking dope? Please say yes. No OTTO/TOOT, no … ooh, political opposition research is called oppo for short, could’ve given us POOP RESEARCH. Likes in the fill: tasty FRO-YO and GNOCCHI, THROW RUG, TAKE FLAK, Pink Floyd’s THE WALL, YANKOVIC. 13a. [Clear of vermin], DERAT. If you’ve never been aware that this is a word, those ORNE and OTIOSE crossings might give you trouble. 41d. [Spanish leather bag that looks like a canteen], WINESKIN. I was expecting a Spanish word here. Apparently it’s this thing, also called a wine bota. 58d. Having no width or depth], ONE-D. Bleh. Nobody spells out the number for x-dimensional. 63d. [“SMH,” verbally], WOW. This is a negative “wow,” not an impressed one. smh means “shaking my head,” typically at the wrongness or idiocy of something or someone. A “Wow. Just … wow” dis. Theme’s okay, fill has some rough patches. 3.4 stars from me. 19A. SWORD SWALLOWERS [They might develop sore throats at work?]. And what a great clue/fill duo. 38A. MADE A BREAK FOR IT [Tried to escape]. 52A. FIRE IN ONE’S BELLY [Obsessive enthusiasm]. “But wait a minute,” I’m thinkin’. Sword and break and belly can all be followed by the word dance, but none of them is a dance step. What am I missing? And what in the world can the title be? I’ve not been able to guess it, so I finally take a look. “Moving Staircase.” Huh? We move when we dance, I get that. But staircase? How does that figure in? And then I really pay attention to the careful placement and the content of the circled squares. 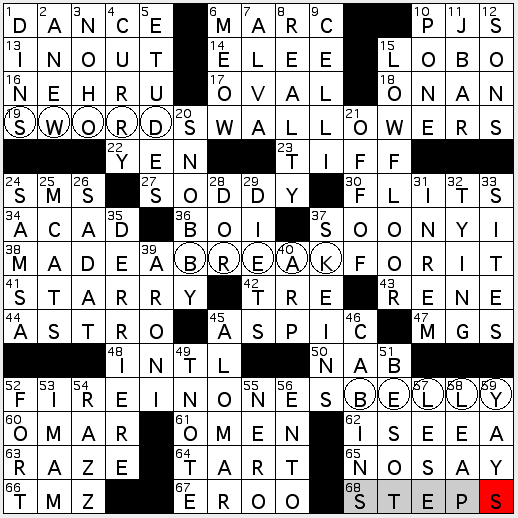 The names of the dances are moving, staircase-style, down the grid—making them dance-steps. D’oh—and smartly done, Madam Constructor! And let me repeat: that is one superb theme set. Other goodies to appreciate? How about the humorous DERRIÈRE [Behind in French class?] pairing; or using the punny [Duds that you won’t wear out?] 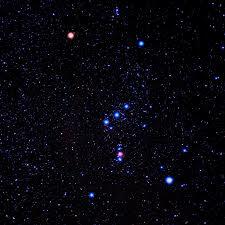 to clue PJS; and reminding us of the STARRY swath that is Orion’s Belt or that an eclipse is an OMEN in some cultures (and not necessarily a good one…). All in all, the sparkle and execution of the theme are a serious cut above the remainder of the fill in this puzzle. Which is a tad of a letdown. But I’ll take my pleasures where I get ’em—and that “moving staircase” has got ’em! Happy St. Patrick’s Day, everyone. 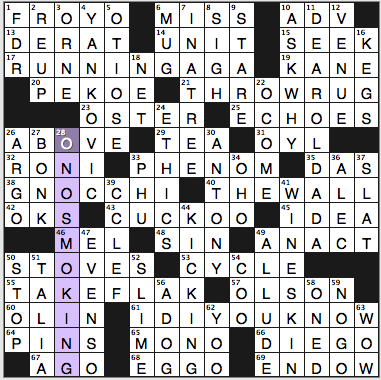 For today’s crossword review, I officially will alter my name to Ade O’Koiki. In honor of the day, Mr. Bob Klahn went for an interesting take on celebrity names for today’s crossword puzzle. In the grid, either the first or last name of each of the four theme answers – clued as riddles which each start with the grid’s title – is replaced with a similar-sounding word that is known for having a green hue. Here’s a bonus riddle for you: What’s green and has its own network? KALE YARBOROUGH (17A: […drives race cars?]) – From Cale Yarborough. ELVIS PARSLEY (31A: […sings?]) – From Elvis Presley. TRAVIS PICKLE (41A: […drives a taxi?]) – From Travis Bickle, Robert De Niro’s character in Taxi Driver. EMERALD LAGASSE (57A: […cooks?]) – From Emeril Lagasse. Again, knowing sports bailed me out, as getting HALAS – as in former Chicago Bears head football coach George S. Halas (5D: [NFC Championship trophy eponym]) – along with a couple of other answers I had filled in at the Northwest portion alerted me to the possibility that a) Cale Yarborough is a theme answer, and b) ‘kale’ might replace “Cale.” After that, it actually wasn’t too hard to fill in the rest of the themes, and I put in the ‘Emerald Lagasse’ entry without any crosses. Good thing that I finally beat into my mind that HAW is left and gee is right, as that has tripped me up before (1A: [It’s left to horses]). 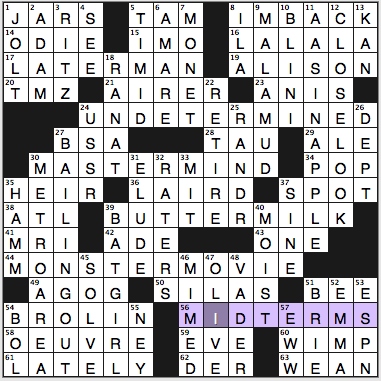 That answer was one of four going across the top and bottom that were three-letter entries, and didn’t notice that geometry until after finishing. The only entry that really, really gave me fits was VARENS (42D: [Adèle ______, Jane Eyre’s charge]). I’m pretty sure there won’t be too many complaints about this Klahn puzzle, as the clues remained very challenging, yet were also more than fair. Agree? “Sports will make you smarter” moment of the day: TRUCKS (16D: [Rigs]) – Former Major League Baseball pitcher Virgil “Fire” TRUCKS (1917-2013) pitched in the big leagues spanning 17 seasons, known mostly for his time with the Detroit Tigers. Trucks is one of only five pitchers in MLB history to throw two no-hitters in a season, pulling off the feat in 1952 for the Tigers. Remarkably enough, Trucks record that year was 5-19. He did end his playing career with a winning record (177-135) and was part of the Tigers 1945 World Series championship team, winning Game 2 of the Fall Classic against the Chicago Cubs. Enjoy the rest of your St. Patrick’s Day, everyone! 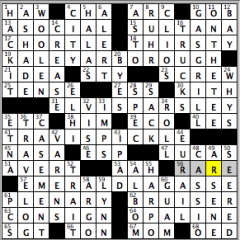 Today’s revealer is, fittingly, in the middle of the grid. 36a [Manhattan landmark, and a hint to this puzzle’s circles] CENTRAL PARK. Sure enough, situated more or less in the centers—and unquestionably in the interiors—of the long theme entries is a hidden word that’s an adjectival modifier for “park”. 17a. [Bureau of Indian Affairs purview] TRIBAL LAND. They haven’t renamed this agency yet? 23a. [1989 handheld gadget release] NINTENDO GAMEBOY. 50a. [Mr. Wilson’s bane] DENNIS THE MENACE. That’s ballpark, dog park, theme park, RV park. Très américain! All span at least two words. Hmm, ‘dog park’ vs ‘dog run’? To the Ngrams! It would appear that the more genteel dog park is both a more recent coinage (the 19th century mentions are alterations of a Dob Park in northern England) and a more au courant one, dramatically increasing in popularity of late. See also, 4d [Driver’s lic. info] D.O.B. Lest you think you could escape St Patrick’s Day for even one crossword, 56a [“__ go bragh!”] ERIN is here to set you straight. The wearing of the green wears on. 18d [Theoretical evolutionary link] APE MAN. This. This is a terrible, terrible, terrible clue. Long obsolete, it perpetuates and promulgates hoary misunderstanding—both in mechanism and structure—of biological evolution. Crosswords should be more reliable with scholastic accuracy. Well, accuracy in general. Except for those damnable ‘Puns and Anagrams’ concoctions. 6d [Light lunches] SALADS. Not always! Be a critical consumer. 51d [West Coast NFLer] NINER. Was so certain it was LA RAM. Similarly, I stuck with MISS for 26d [Young lady] GIRL for too long. 39a [Word before drill or engine] FIRE, followed by 41a [Clothes drier] AIR, which is crossed by 25d [In this world] ON EARTH. So, uh, where’s WATER? Nowhere to be found, potable or otherwise. Good theme (not of the park variety). Solid puzzle. This entry was posted in Daily Puzzles and tagged Bob Klahn, C.C. Burnikel, David Phillips, Elizabeth C. Gorski, Matt Jones, Zhouqin Burnikel. Bookmark the permalink. Ah, the poor old black cuckoo: the ANI. 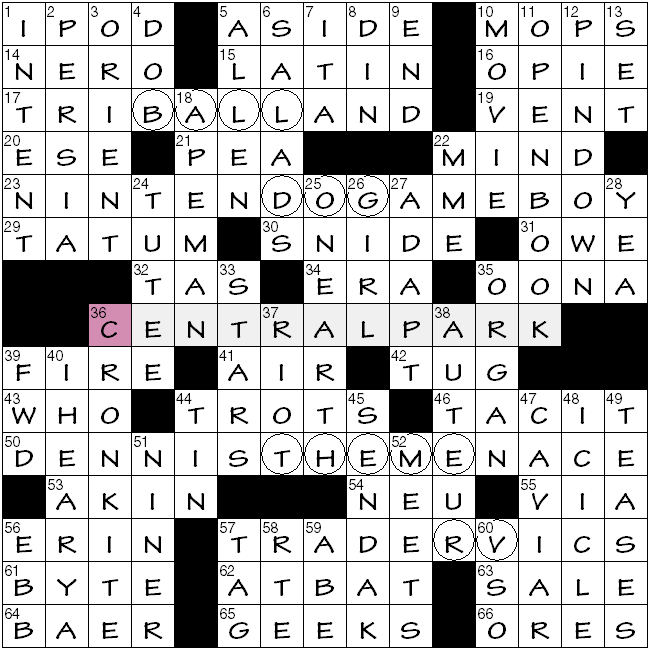 Once a well known resident of the crossword aviary, now, not so much. The bird having been displaced by singer ANI DiFranco and various Wheel of Fortune clues (and in the plural, the liquor favouring, as Amy points out). However, the ANI cuckoo (from what I’ve read) is common in Florida, so we’re hardly dealing with an uber-obscure animal here, that lives only outside of the USA. So maybe, just maybe the poor “little” ANI deserves the occasional crossword comeback. Whad’ya say? And it’s not that little either. ANIS debate aside: a fun puzzle, especially for the dreaded Tuesday slot. Google wasn’t very helpful in providing alternate definitions for ani–being a bird is completely legit–although the Urban Dictionary did list a definition that could show up in a Jonesin’ puzzle. I live in Florida, next to a swamp filled with birds, and the ani hasn’t made it as far north as the Kissimmee area yet. Probably a lot of them in the Everglades and Keys though. I did see a bald eagle the other day. What’s green and complains in a glade? On the Burnikel LAT, it took me a minute to catch on – all those incomprehensible across clues W*F – then I went from hating it to loving it. C.C.’s pulled off a totally new idea extremely well. The rating system isn’t allowing me to vote on this one for some reason, but it gets 5 stars from me. But it’s always great to hear The Kinks! Wow – another CS from Mr. Klahn that I thought was terrific and apparently everyone else detested. Other than not being familiar with the silly movie character, there was little about which to complain; it was a challenging and fun puzzle. Agree with Art. What’s not to love when Bob Klahn’s punny St. Paddy’s day themers have such wonderful fill. Hack it, a shade, crease, casement, plenary, consign, bruiser. And on it goes. Great puzzle. Disagree. Despise Klahn’s cluing. Not fun. Thanks for getting me out of a pickle with this crossword. Love your bonus answer. My husband thought the NASA answer was cool. Late comment but on the NYT I got ILO and ILA mixed up. If only the clue for 19-Across had referenced ALISON Bechdel (famous for the movie “test”, author of Fun Home, etc.) then I’d have figured it out, no problem! But because of the cross reference with 51-Down I was lost. I thought there was someone named BRIE oLISON (hey, Bree is a first name, so why not Brie?) instead of ALISON BRIE. I thought this was kinda funny so I’m passing it on…probably no one reading so many days later.